“That’s what great players do,” Michigan State coach Tom Izzo said. Purdue’s Carsen Edwards had a season-low 11 points on 3-of-16 shooting, including 2 of 13 from the 3-point line. Ryan Cline, the Boilermakers’ second-leading scorer, had 12 points on 4-of-12 shooting. Edwards entered the game averaging 25.5 points to rank among the nation’s leading scorers. “He’s a very confident and talented player, but at times he doesn’t let things come to him,” coach Matt Painter said. “He has such high peaks sometimes he’ll have a game like this because he wants it so bad that he starts pressing. Winston, though, scored three of the Spartans’ next five points to push their lead to nine. “He’s crafty, breaking you down and scoring for himself and creating for his teammates,” Painter said. 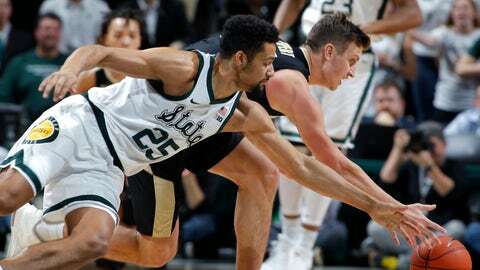 Michigan State’s Nick Ward scored 16 points and Xavier Tillman had 11 points. Purdue’s Evan Boudreaux, a key player early in the game, was limited to 10 minutes in the first half and didn’t play after halftime because of a groin injury after scoring five points, grabbing two rebounds and making a steal. “Everybody’s stepping up and playing big roles,” Winston said. “My heart goes out to the family and everyone in the Purdue family,” Izzo said.